Shiny kitchen gadgets will always be in style, especially when they stand out form other shiny kitchen gadgets. If your plain-old boring measuring spoon shave lost their luster over time, perhaps it’s time to upgrade to something… bling-ier. 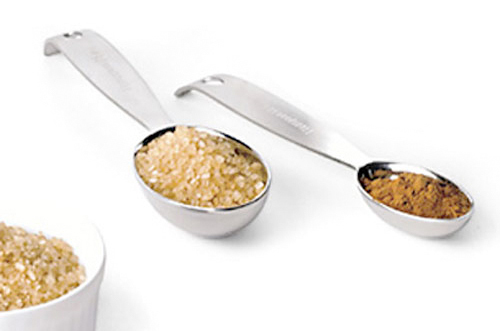 These Diamond Ring Shaped Goldtone Measuring Spoons will add a new sparkle to the kitchen. 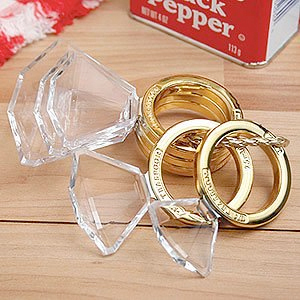 Plus, at a price of less than twenty dollars they might be the least expensive way to add some bling to your kitchen. It usually isn’t a good idea to try to force kitchen gadgets to change their shape. 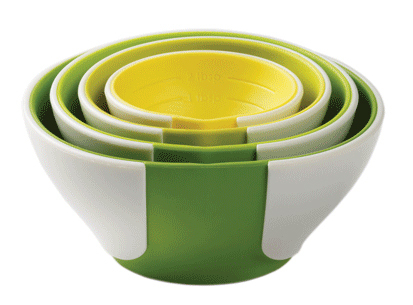 However, when it comes to these Chef’n SleekStor Pinch Pour Prep Bowls that is exactly what you are supposed to do. The set of four nesting prep bowls come in five different styles—Hot Cocoa And Buttercream, Arugala, Cherry, Trend and Tonal (pictured)—and form convenient pour spouts when pinched. The insides are marked with gradations for measuring liquid ingredients, making this prep bowl set a great versatile addition to any kitchen. Measuring spoons are pesky little kitchen utensils: they are never where you expect them to be and when you do find one, it’s usually the wrong one. Keeping them all attached on a key ring is one way to keep ‘em together—assuming you can find it in the back of the drawer. 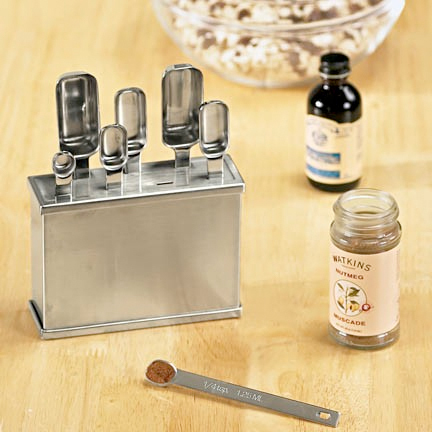 This set of Measuring Spoons & Caddy keeps the handy utensils always within reach on the countertop. The stainless steel set is unobtrusive and as an added bonus, even comes with an extra tablespoon—just in case one gets misplaced. It is famously difficult to judge the serving size of pasta in a pre-cooked state. The conundrum, delicious as though it may be, is easily solved with a little help from a measuring guide. The Epicurean Gourmet Series Pasta Server Utensil helps to determine serving size of dry spaghetti, linguine or fettuccini by offering three pre-measured guides incorporated directly into the utensil. 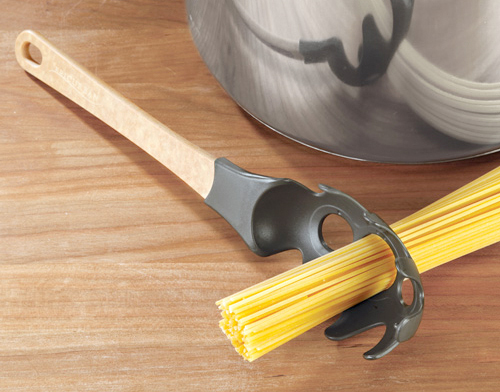 Put to use as a stirrer and serving spoon while the pasta cooks, and the handy kitchen tool is one all-in-one solution that won’t stretch your noodle. The eyeball test when measuring ingredients works well for some people, but others find comfort in facts. A recipe that calls for a dash, a smidgen or a pinch can send shivers down the spine of those who prefer to know what they’re getting into when heading into the kitchen. Perfectly understandable; sometimes edible results are more desirable than culinary experiments. Measuring spoons. Handy little devices–when you can find the one you are looking for. Even the ones that come attached to a plastic ring tend to get separated and subsequently lost. Forget building a better mousetrap, at least when it comes to baking essentials, it’s all about corralling those measuring spoons. 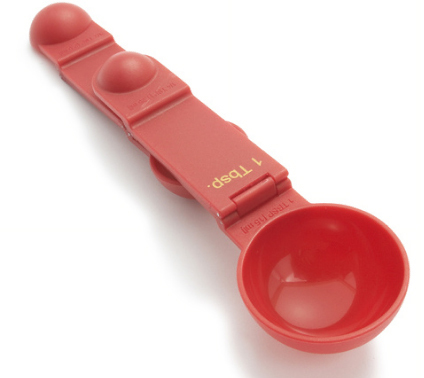 This set of Foldable Measuring Spoons at Sur La Table would do nicely. Including four of the more commonly used measurements of ¼ tsp., ½ tsp., 1 tsp. and 1 Tbsp, the one you are looking for is always at hand. Assuming, of course, you don’t misplace the entire set. For $3.95, maybe picking up an extra set isn’t a bad idea. Looks like the folding measuring spoons from the link above got lost. Luckily that isn’t the only place to get measuring spoons that don’t wander off. 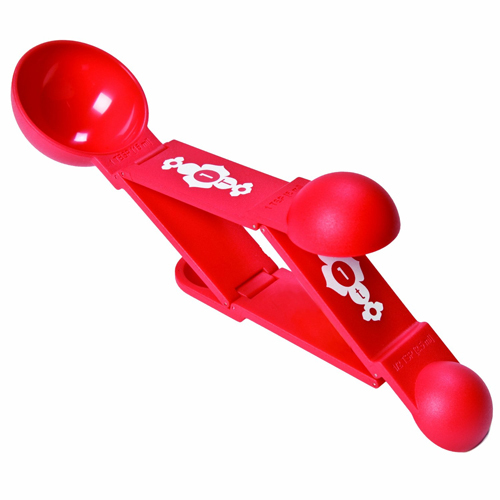 Check out the Talisman Designs Flip’n Good Measuring Spoon available on Amazon in a variety of colors.